SERI KEMBANGAN: Iskandar Investment Bhd (IIB) and China-based real estate developer Zhuoda Real Estate Group have entered into two framework agreements to develop mixed residential and commercial projects in Medini Iskandar Malaysia in Johor. This marks the first real estate investment by a foreign company in Medini and the biggest project investment in the area to date. The gross development value of the project is estimated at RM2.5bil while the gross development cost is about RM1.85bil. IIB and Zhuoda subsidiary, Qingdao Zhuoyuan Investment Holdings (Zhuoyuan), will jointly develop the first two of the three-phase project. The third phase would be developed solely by the Chinese company. Medini is IIB's flagship development in Medini North, its leisure and tourism area. It is set to come alive next year with the opening of Asia's first LEGOLAND theme park, together with a complementary lifestyle retail mall, hotels, healthcare services, offices and residential projects. 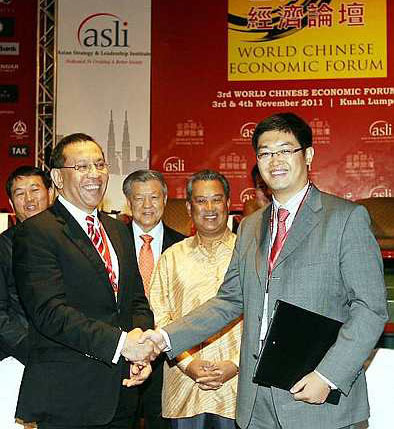 The signing ceremony yesterday was held in conjunction with the 3rd World Chinese Economic Forum in Seri Kembangan. IIB president and chief executive officer Datuk Syed Mohamed Syed Ibrahim told a news conference the project was expected to be completed over the next 10 to 15 years and that work on the first phase would start next year. The first framework agreement is for the formation of a joint venture between IIB and Zhuoyuan to develop a residential project on an 18.14-acre plot in Medini North. The project, 80% owned by Zhuoyuan, would have a total sales value (TSV) of RM157.6mil, with the estimated investment reaching RM1.2bil. The second framework agreement is for the sale of lease for a 9.74-acre plot, also in Medini. Zhuoyuan would carry out a mixed-use development on the site. It would have a TSV of RM70.8mil and the total investment is estimated at RM520mil. “Zhuoyuan's investment in Medini is a clear affirmation of the company's confidence in the growth potential of Iskandar Malaysia and IIB as its investment partner to take advantage of opportunities in South-East Asia,” Syed Mohamed said. “As a strategic partner of the 3rd World Chinese Economic Forum, we encourage more businesses from Malaysia and China to seek ways to further enhance cooperation, despite the current global economic uncertainties, and subsequently contribute towards the quest of reviving the Silk Road,” he added. Iskandar Malaysia has recorded committed investments of RM77.82bil from various sectors as of September this year, according to Iskandar Regional Development Authority. Ready for living: (Above) The USJ One Park Twin Villas features a sleek architecture with features (right) such as air-conditioning units, centralised vacuum system, a jacuzzi in the master bedroom suite, a private lift and an intercom system connected to the security post. As urban consumers get more sophisticated, so do their homes. With this in mind, the USJ One Park Twin Villas is designed for those with a taste for modern lifestyle. BHL Group of Companies executive chairman Datuk Lim Boo Kian said the three-storey semi-detached units come with private lifts, centralised vacuum system and a whirlpool jacuzzi. “Having a lift inside the three-storey house gives it an exclusive feel. It is also good for families who live with their elderly parents as it gives the old folks more mobility around the house. “The lift is imported from Sweden and comes with a two-year warranty,” said Lim during the launch of the development at its sales gallery in USJ 1, Subang Jaya. He said the centralised vacuum system was also a convenient feature which makes cleaning the house easier. “There are several points around the house and all you need to do is connect the hose to it and start vacuuming. It is hassle-free and you change the bag once or twice a year,” said Lim. There are only 36 units available for sale, each with a built-up area of 3,772sq ft and comes with air-conditioning units and sanitary ware. Besides the Twin Villas, the entire USJ One development also consists of 61 terrace houses and two blocks of condominiums, both of which are already 90% sold. All three developments are nestled within a gated community with its own landscaped park. “All the houses also have an intercom system which is linked to the security post. There are about 30 units of CCTV along our perimeter fencing so residents will not have to worry about security,” said Lim. He said residents of the houses can also use the facilities in the condominium like the swimming pool, gymnasium and rooftop garden. 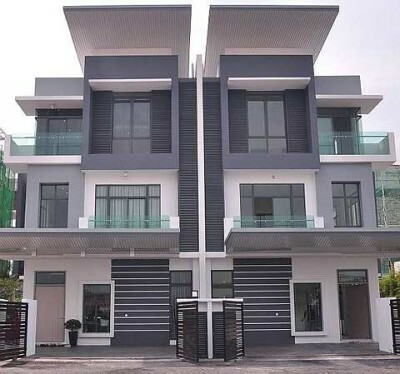 The selling price of the Twin Villas units is from RM2.388mil onwards. For details, call 03-2278 1118. Boasting a tranquil setting, Bandar Enstek appeals to those who want quick access to the KL International Airport (KLIA) in Sepang. The project is approximately 15 minutes from the airport and less than half-an-hour from Putrajaya. Located in Negri Sembilan, it is also accessible by the Elite, PLUS and MEX highways. Bandar Enstek, wholly-owned by TH Properties Sdn Bhd, is projected to have a gross development value of RM9.2bil upon completion in 2025. Living it up: The show unit of a Mediterranean-styled house. TH Properties is owned by Lembaga Tabung Haji. The total land area is 2,071.58ha and it is freehold. TH Properties sales and marketing head Mohd Iskandar Omar said Bandar Enstek’s selling point was its proximity to the airport. “Although it is situated outside the Klang Valley, it is not too far from Kuala Lumpur. “It is a quiet and safe environment,” he said to members of the press during a site visit. The current development phase — timur@enstek was launched in December 2006. An upcoming project in timur@enstek known as Rembulan, offers 124 units of semi-detached houses. Spacious: Bungalows are available in Bandar Enstek. The homes are spread over 12.54ha of freehold land. This low-density project is scheduled to be launched this month and expected to be completed by November 2013. Priced between RM622,400 and RM1.069mil, the four designs which are available range from built-up areas of 2,555sq ft to 3,117sq ft. The houses are also equipped with security alarm systems. The intermediate units have five bedrooms and five bathrooms while corner units have six bedrooms and six bathrooms. “It is spacious, 28% to 35% bigger than houses in Kuala Lumpur and Petaling Jaya. “It is suitable for large families. The designs allow for efficient air flow and natural lighting,” Mohd Iskandar said. He said the target markets were the middle- to high-income groups. 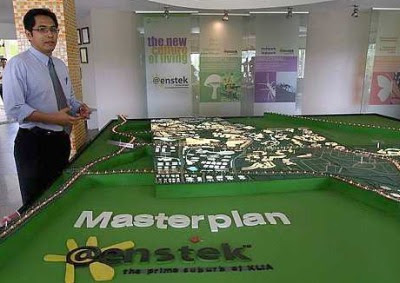 Overview: Mohd Iskandar with a model of Bandar Enstek. “Some may buy it as a place for them to retire to,” he added. All purchasers will be entitled to free legal fees and disbursements for the Sales and Purchase Agreement, and stamp duty for the Memorandum of Transfer will be borne by the developer. To serve the daily needs of the community, village@enstek, a neighbourhood commercial development, offers F&B outlets, a mini market, laundry services, clinics and even a spa. Substantial acreage in Bandar Enstek has been devoted to an area called Bandar Enstek Educational Complex, which will include several institutions of education from secondary to tertiary level. As for industrial development, techpark@enstek covers an area of 212.06ha, touted to have the largest cluster of local and international biotechnology companies in Malaysia. It is fast becoming a hub that caters to the needs of investors such as Bomba Malaysia, Jakim, Coca-Cola Bottlers Malaysia Sdn Bhd and Felda. TH Properties is also constructing an 18-hole golf course and clubhouse, and other community-centric facilities. 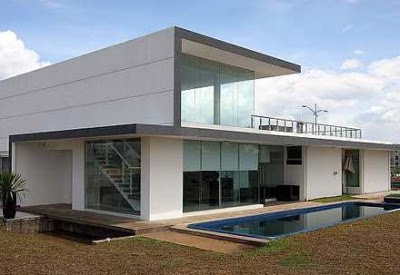 For details, visit www.th-properties.com or call 06-799 7886. SEPANG: TH Properties Sdn Bhd, the property arm of Lembaga Tabung Haji, a pilgrims' fund management institution, expects a new wave of investments next year from local and foreign parties at its Bandar Enstek development in Sepang, Selangor. TH Properties chairman Datuk Azizan Abd Rahman said although the market now is a bit uncertain as far as the global economy is concerned, he is optimistic the company will be able to attract investments of up to RM60 million. "We are in negotiations with a few multi-national companies (MNCs). We are also not keeping our doors close on Google Inc, which once said it was looking to invest here. "Should they (Google) decide to make an investment in Malaysia, we hope to attract them back here," Azizan said yesterday at the launch of Rembulan, a new series of houses within "timur@enstek" yesterday. Since its inception, Bandar Enstek has attracted investments of more than RM2 billion from government bodies and the corporate sector. Bandar Enstek is a 2,046-hectare integrated township located nearby the Sepang F1 Circuit and the Kuala Lumpur International Airport. It comprises four main components namely residential, a commercial hub, institutional zones and techpark@enstek. timur@enstek is the third residential phase for the development. 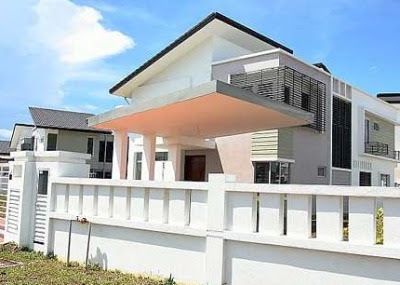 On Rembulan, TH Properties is introducing 124 semi-detached homes each priced between RM622,400 and RM1.07 million, or collectively at RM95 million. Azizan is confident that the houses will attract buyers from within the neighbourhood and Kuala Lumpur. ""As far as the property market is concerned, I would expect a bit of a slowdown next year. But since we are targeting the middle income group, I don't think our development will be affected. "Any major setback in the economy, the speculative kind of investment would suffer. Here, we don't have speculators. They buy and stay for their own use," he added. Azizan said TH Properties aims to start developing an 18-hole golf course on 64ha surrounded by resort homes at Bandar Enstek by mid-2012. It is also looking to partner a company in India to jointly undertake a luxury development in the area. "While we are deciding to move to the luxury market, our base will always be the middle income segment. We just need some form of recreation for the MNCs and other investors at the development," Azizan said. Sunway Bhd today said it is not involved in any discussion with conglomerate Sime Darby Bhd to jointly develop townships in Iskandar Malaysia, Johor. Nevertheless, as a leading property and construction company, Sunway said it is constantly on the lookout for property development opportunities locally and abroad. "We will keep our shareholders appropriately notified through timely announcements made to Bursa Malaysia Securities Bhd," it said in its filing to the exchange in Kuala Lumpur. It was Bernama reported yesterday that the two companies were likely to jointly develop townships in Iskandar Malaysia. Quoting industry sources, the report said the government was allocating land for the joint development and that the companies were buying the concession land for a good price. The sources said it was also understood that both companies would sign a memorandum of understanding in the next few weeks, and that such a collaboration between government-linked companies (GLCs) and the private sector was best for Malaysia's future development. The joint development could be a strong message for Malaysian companies to forge relations with GLCs and play their part in the next stage of the country's development. Joint development between GLCs and the private sector was also stressed by Deputy Prime Minister Tan Sri Muhyiddin Yassin in building a sustainable and inclusive economy and drive Malaysia towards developed nation status by 2020.